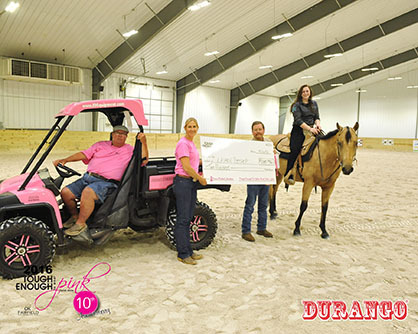 The weekend of September 16-18 marked a milestone for the Tough Enough To Wear Pink Horse Show as the organization celebrated its tenth anniversary. 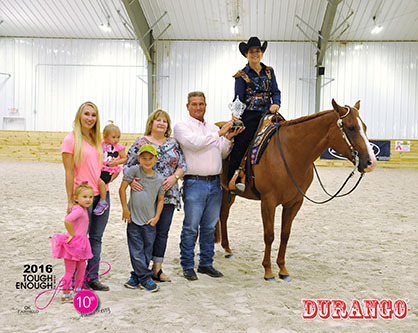 The 2016 event took place at the newly revamped World Equestrian Center in Ohio and was met with a wonderful turnout with over 400 stalls reserved and 1,400 entries recorded from seven states. 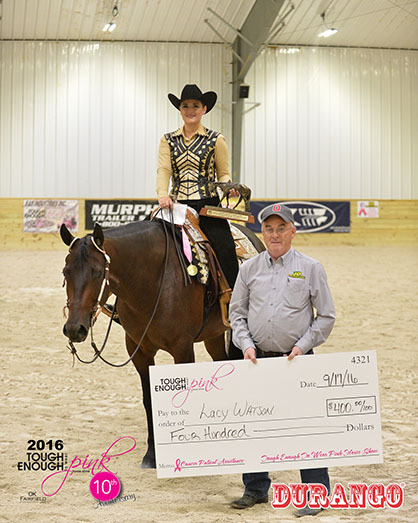 $12,000 in guaranteed prize money was awarded as well as All-Around High Point and Reserve High Point to four different age groups. Like in the past, 100% of the show’s proceeds go to the Ohio Health Foundation to support cancer patients and their families. The donations are currently being tallied, and show management expects the amount will be sizable this year. 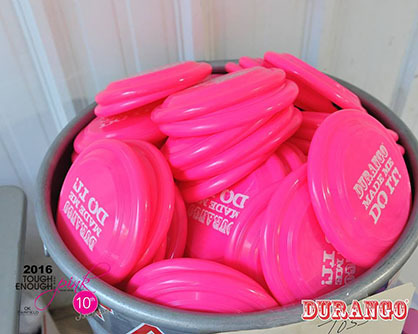 Last year, the event raised $81,700 for cancer patient assistance. Judging the show was April Devitt, Rhonda Replogle, and Art O’Brien. 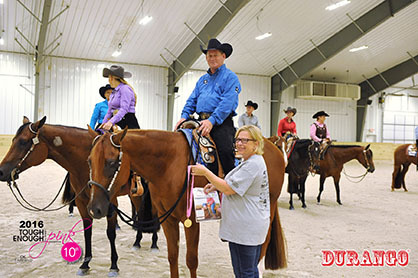 In addition to a full slate of classes and a silent auction, there were numerous special events, like a Repeated In Red Wine Tasting, and new memorial classes in honor of equestrians who have lost their battles with cancer. 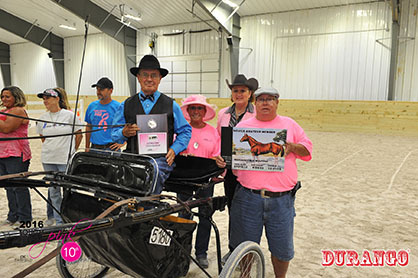 New for 2016, the Sue Mulford Pleasure Driving Classic $500 was won, quite fittingly, by Sue’s husband, Denny Mulford. Denny and Sue were married for 50 years after first meeting on a church hayride when they were 13 and 12 years old. 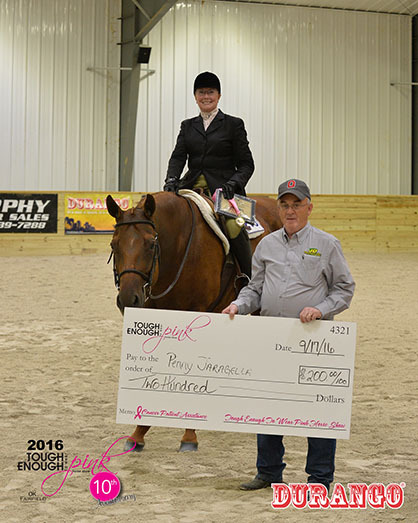 The Bob Menker Western Pleasure Classic $500 was won by Ty Hornick, who rode an entry for Tammy Gagliardo. 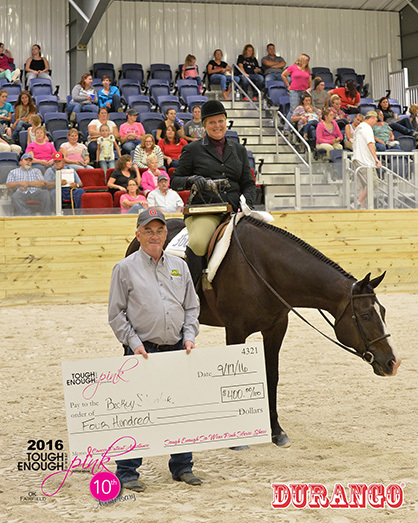 Finally, the Mary Harwood Walk Trot Classic $500 was won by Christina Froelic with an entry for Denny Mulford. 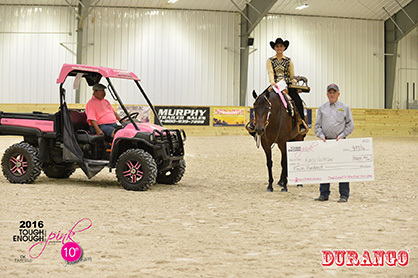 Another highlight of the show was the JD Fall Classic with $5,000 up for grabs. 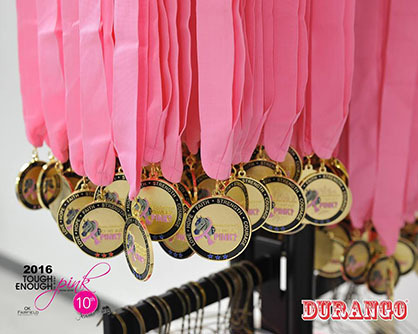 The Tough Enough To Wear Pink Survivors’ Walk Trot class is a special event for any competitor who’s a survivor of any type of cancer. The winner was Kristin Rhoades. 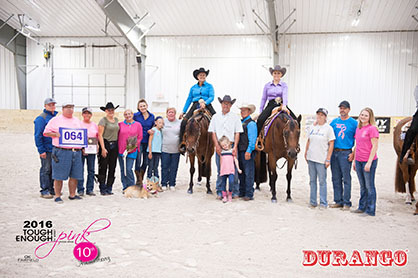 The largest class of the horse show, with 51 entries, was the Loni Grice Memorial Walk Trot, where competitors are invited to ride in memory of any individual who has lost his/her fight with cancer. 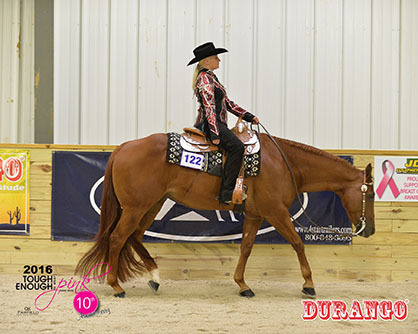 The winner was Lynne Puthoff with an entry for Jack Bohannon. 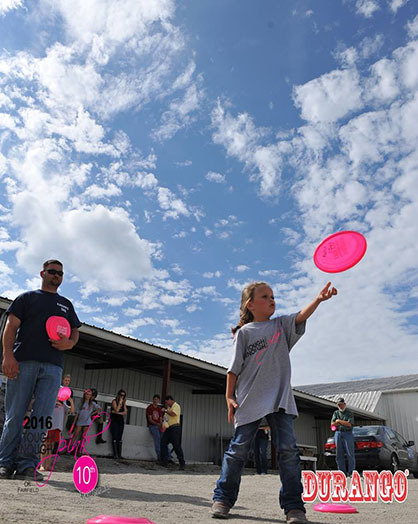 The always entertaining Ohio Health Foundation Pink Egg & Spoon class had a repeat winner for the third year in a row, Samara Ackers. 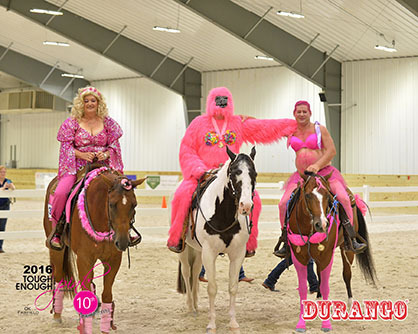 Finally, the Trainers’ Pink Challenge and accompanying calcutta was a big hit once again with some very “creative” costumes. 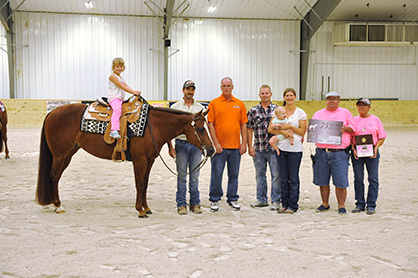 In a fun surprise, AQHA trainer, Marti Limoli, married Gary Klinger in a special ringside ceremony. Marti is a breast cancer survivor and thought the event would be the perfect place to get married. 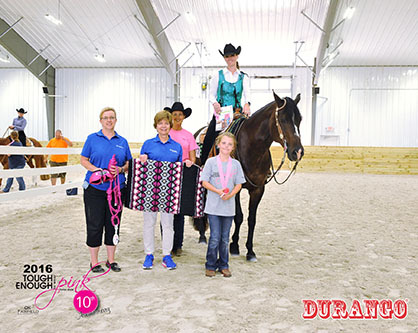 Scroll below to view more fun photos from around the rings at the 10th anniversary of the Tough Enough To Wear Pink Horse Show. 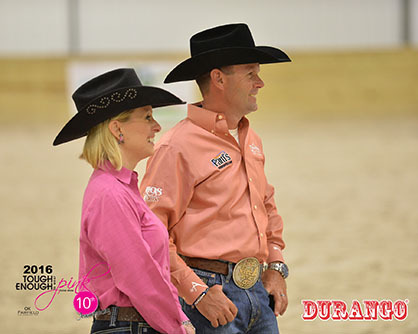 Judges of the Trainers’ Pink Challenge, Robin and Laura Schoeller.